Cryonics is a fascinating concept that has inspired the imagination and dreams of thousands of people worldwide. If you're someone interested in the theory, remarkable potential and practical applications of cryonics, joining CI is a great way to learn more and get involved in the cryonics movement. Our members come from all walks of life and from all around the world, united by our interest in cryonics and the potential benefits it holds for ourselves and for all mankind. As a member, you will be one of the owners and operators of the Cryonics Institute, as we are wholly owned and operated by our membership. CI is run by a Board of Directors elected exclusively from our members, by our members - so we have no outside investors, managers or other parties dictating our operations. Our responsibilities are to our patients, our membership, and to advancing our founder Robert Ettinger's vision. CI membership is an excellent starting point for anyone interested in cryonics to learn more and be part of an exciting, potentially world-changing community of forward-thinking people. There are no specific duties or formal responsibilities required for membership, apart from applying and paying the membership fees. However a large number of our members take a more active role in the organization either as officially elected Officers or as volunteers. How active you choose to be is completely up to your own discretion. Please note, Cryonics Institute Membership is required if you are actively planning cryonic suspension services for yourself or a loved one through CI. Our "Members-Only" policy for cryonic services helps ensure the quality of our suspensions, and maintains the integrity of our organization and operations. CI is our organization and as member-owners it's clearly in our own best interests to manage it efficiently and especially to insure the highest standards for our suspension arrangements. There are two classes of CI Membership. A Lifetime Member pays a one-time fee of $1,250 and can arrange for cryopreservation at CI for $28,000, usually by making CI the beneficiary of a life insurance policy. Other close family members can join for an additional $625 (there is no charge for minor children). An Annual (or Yearly) Member pays a $75 initiation fee plus $120 yearly (or $35 quarterly) and can arrange for cryopreservation at CI for $35,000. Every Yearly Membership family member must pay the same price. Neither of these fees include the cost of preparation or shipment by a local funeral director, which must be arranged separately (often with a Local Help Rider). To join, simply fill out a membership form for the type of membership you desire, Annual ($120/year recurring) or Lifetime ($1,250 one time.) The forms are available below or can be mailed on request. To learn more about membership options and details, please see our Frequently Asked Questions. We also provide a special Membership Outreach program that gives you the opportunity to speak one-on-one with a current CI member who will help answer your questions via phone or email. CI Membership grants members certain privileges as cooperative partners in our organization, including voting rights and the opportunity to run for any of CI's official elected offices, up to and including the Presidency. All members are also invited to the Annual General Meeting every year, hosted at CI's Michigan facility. Individual tours or visits can be scheduled any time of year upon request. Members also receive a free subscription to CI Magazine, available in both mobile (web-based) and pdf format suitable for download and offiline reading or printing. For samples of the magazine, please scroll to the "Publications" section on our home page. Membership does not include any obligation to contract for Cryopreservation Services with CI. A Lifetime or Annual Membership is, however, required to arrange for Human Cryopreservation, Pet Cryopreservation or DNA / Tissue Preservation services. Please note, these optional services are NOT included in the cost of membership. Members must contact CI Headquarters to contract these services, which require additional forms and payment. Human cryopreservation prices do not include "Local Help" cost for a funeral director or shipping, which can range from nothing in Michigan to $3,000 on the US west coast — and more overseas. Human cryopreservation prices do not inculde "Standby Help", which can range from $500 to $100,000 depending on distance from CI and options such as SA or air ambulance. Membership is required to make arrangements for human cryopreservation, pet cryopreservation or tissue/DNA cryopreservation with CI. 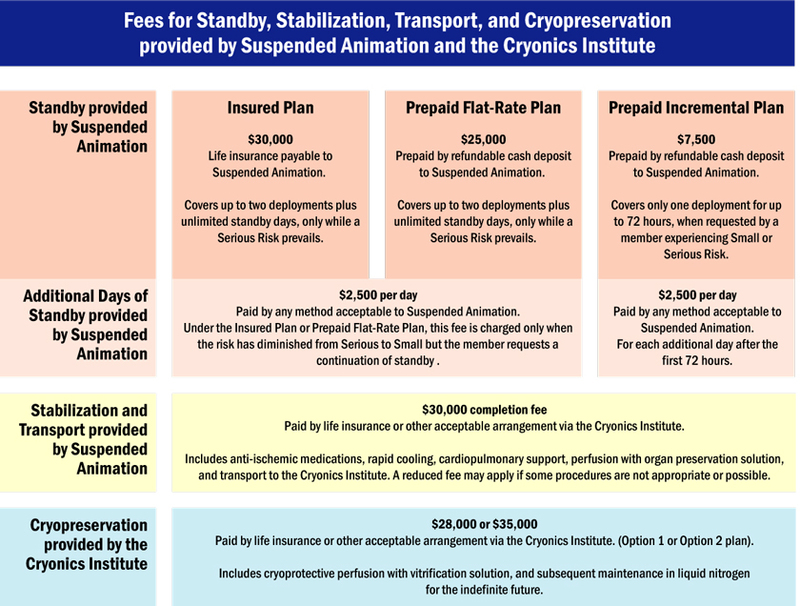 One-time human cryopreservation fees and additional costs are usually paid by life insurance policies that make the Cryonics Institute the beneficiary. *Currently Suspended Animation's services are only available to the Continental United States. They are not available for overseas members. To receive either a Lifetime or Annual Membership Application via mail, please contact us.